TT@TT 20th September 2018 featuring SMSG School Orchestra and SMSG Church Band. The church band began with a sing-a-long which introduced the 81 children who came to some old favourites which they found quite fun, including "Daisy Daisy" and “Five Foot Two Eyes of Blue" which the adult audience knew well. My favourite was Mellow Out. There were repeats for all three and the Church Band joined in with them too which was fun. 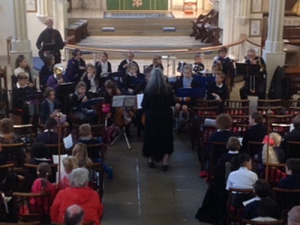 The children had only had 3 practices since the beginning of term, before they performed the pieces for us. We ended with another sing-a-long, finishing with You'll Never Walk Alone. During the second half, the three young percussionists had a go at playing with the Band and are to be commended! 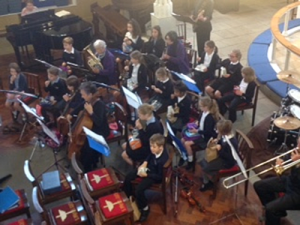 A very enjoyable and entertaining lunch time concert. 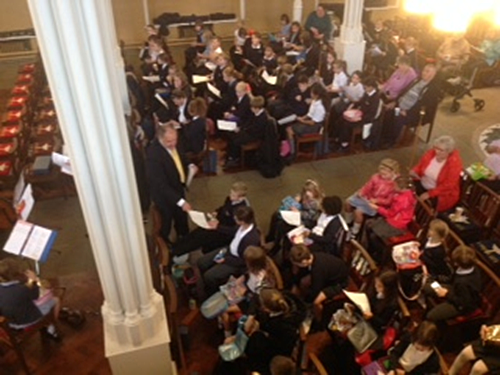 Congratulations to all the performers.